Louis I. Miller, the son of Mr. and Mrs. J.F. Miller, grew up in Bucoda, Washington, and was an outstanding athlete at nearby Centralia High School, playing on the varsity teams in baseball, basketball, football and track. He was also a talented musician, able to play the piano and saxophone. When Miller played third base for the Bucoda team, townsfolk would send word around the area and there would be a large turnout for the game. After graduating from high school, he played for South Bay in the local twilight league before joining the semi-pro Olympia Senators of the Northwest League in August 1937. 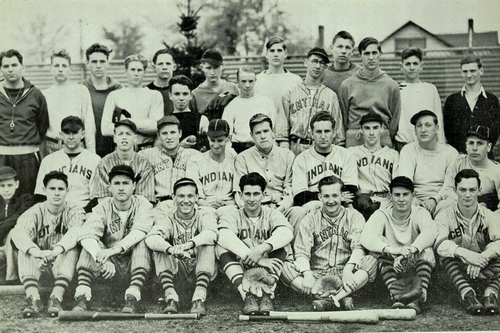 He enrolled at Washington State College (now Washington State University) at Pullman, Washington, in the fall of 1937, and played semi-pro baseball in the summer of 1938 with the Centralia Outlaws of the Southwest Washington Timber League. Miller's time at Washington State was brief as he signed with the St. Louis Browns' organization in September 1938. He returned to college in the fall but left in February 1939, to attend spring training with the Browns in Los Angeles. He was assigned to the Paragould Browns of the Class D Northeast Arkansas League for his rookie year in professional baseball and made a promising start batting .273 in 121 games, with eight home runs and 58 RBIs. Miller was back with Paragould in 1940, and batted.287 with 10 home runs and 64 RBIs, as the team cruised to first place in the league standings and clinched the playoffs in three games over the Jonesboro White Sox. With military service on the horizon, Miller did not play baseball in 1941. Instead, he returned to Washington State where he was an honor student and entered military service with the Army Air Force on November 7, 1941. Miller took pre-flight training at Kelly Field, San Antonio, Texas, then primary flight training at Grider Field, Pine Bluff, Arkansas. He was at Perrin Army Air Field, Sherman, Texas, for basic flight training, and Lubbock Field, Texas, for advanced flight training. He earned his pilot's wings and a commission as a second lieutenant at Lubbock on July 3, 1942. A week later, Miller married Florence Toothaker, the daughter of a Centralia dentist. They had known each other for six years. Miller was then stationed at Salt Lake City, Utah; Walla Walla Army Air Field, Washington; Gowen Field, Boise, Idaho; El Paso, Texas; Topeka Army Air Field, Kansas; Smoky Hill Army Air Field, Salina, Kansas; and San Francisco, California. He departed for duty in the Pacific Theater at the beginning of December 1942. Assigned to the 63rd Bomb Squadron of the 43rd Bomb Group, Fifth Air Force, Miller was initially stationed in Australia, before moving to Port Moresby in New Guinea. On the morning of March 3, 1943, Second Lieutenant Miller was co-pilot to First Lieutenant Woodrow W. Moore aboard one of three Boeing B-17F Flying Fortresses that left Port Moresby to bomb a Japanese convoy in the Bismarck Sea, about 50 miles east of Lae, New Guinea. At around 10:30 A.M., as the bombers were approaching their target, Japanese fighter planes attacked them. 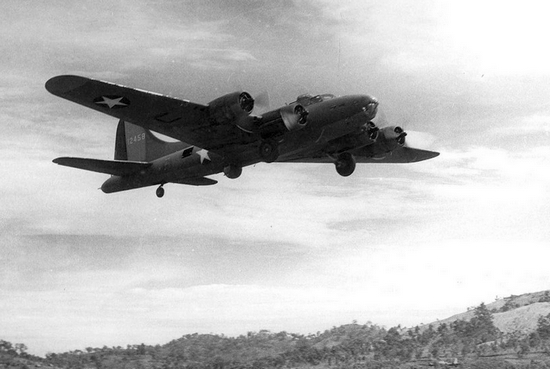 Miller's B-17, known as Double Trouble and flying in the No. 2 position, was hit and a fire started in the radio compartment. The pilot ordered the rear of the plane to be abandoned and five men were seen to jump out. All parachutes opened but one man had apparently neglected to fasten either his chest straps or his leg straps and when his parachute opened, he was jerked out and fell into the water below. As the remaining four slowly descended, Japanese fighter planes mercilessly strafed them and all were dead by the time they hit the water. The remaining four officers - including Miller - and one enlisted crewman remained with the burning plane and completed the low-level bombing run on the Japanese convoy. First Lieutenant Moore then gained altitude and pulled the plane out of formation. "He gave a salute and a big smile," said Captain Willis E. Brady, pilot of one of the other two B-17s, "and headed the plane down for the water." The B-17 was about 300 feet above the water and still in the middle of the Japanese convoy with the fire raging in the radio compartment when it broke into two pieces and crashed into the sea.' The bodies of all 10 crewmen were never recovered and are memorialized at the Manila American Cemetery at Fort Bonifacio in the Philippines. Miller was posthumously awarded the Silver Star and Purple Heart. "My proudest day," recalled his widow, "was the day I went out to Bolling Field Army Air Base, Washington, D.C., to receive for him the Silver Star." In a heartfelt letter to Washington State College, Florence Miller explained how she felt compelled to help the war effort following the loss of her husband. "I am now serving in the United States Marine Corps," she wrote in June 1944, "trying in my small way to carry on for him and help bring closer the victory and cause for which he so readily gave his life." In 1944, Lou Miller's commanding officer, Captain Folmer J. Sogaard, visited Florence Miller, in Centralia. A romance blossomed and they married in 1945. Sogaard retired from the Air Force as a lieutenant colonel in 1960, and became a tireless promoter of Centralia and its business community. Florence passed away on November 3, 2004. Folmer Sogaard was 93 when he passed away on July 17, 2008.